There is art news on the front page of today’s New York Times, and thank God, it’s not about a museum theft or a half-a- billion-dollar sale of a questionable da Vinci. No, this time it’s good, uplifting art news. 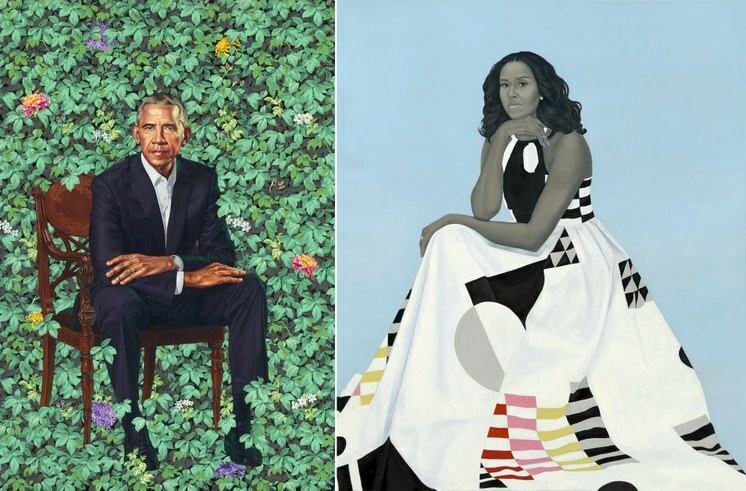 Yesterday, the National Portrait Gallery in Washington, D.C., unveiled the official portraits of President Barack Obama and First Lady Michelle Obama. From left, Kehinde Wiley, Barack Obama, Michelle Obama, and Amy Sherald. Photo by Souza-© 2018 Pete Souza. 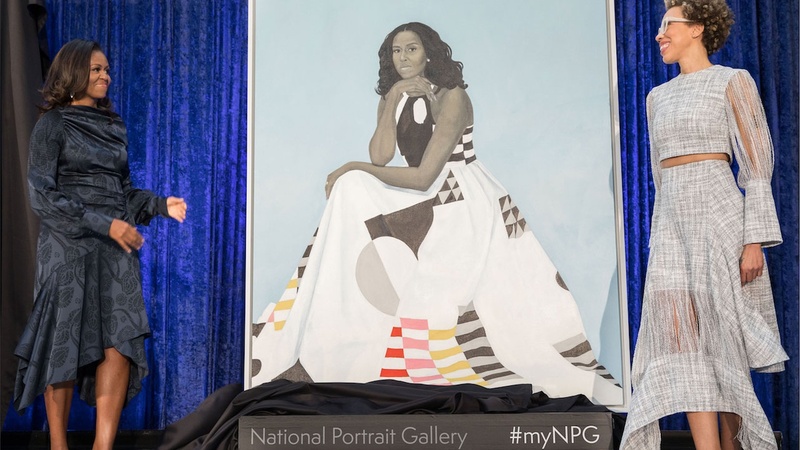 And the event was worthy of attention, not only because these are the portraits of the first black president and first lady, but also because both portraits are painted by black artists who did a much better job than most of their predecessors. The National Portrait Gallery is full of traditional, academic, banal presidential portraits. But the portrait of Barack Obama is painted by Kehinde Wiley, a much-celebrated African-American artist raised in South Central Los Angeles. L: Barack Obama by Kehinde Wiley, oil on canvas, 2018. © 2018 Kehinde Wiley. R: Michelle LaVaughn Robinson Obama by Amy Sherald, oil on linen. 2018. Photos courtesy of National Portrait Gallery, Smithsonian Institution. Mr. Wiley is famous for his eye-catching, life-size portraits of young, cool black men presented in the dramatic style of European royal portraiture. The backgroundof his glamorous portraits is usually a bright, floral pattern reminiscent of wallpaper or tapestries. In this new official portrait, President Obama sits in a chair, arms crossed. He is not just looking—he is staring at us, wanting to connect. And connect he does. The artist succeeded in the most difficult and important task: capturing the spirit and essence of Barack Obama. L: Statue of Martin Luther King Jr. by Lei Yixin at the King Memorial near the United States National Mall. Image credit: Pixabay. R: Portals, Njideka Akunyili Crosby. 2016. Image by Sharon Mollerus, Flickr. The portrait of Michelle Obama was painted by Amy Sherald, a well-regarded African- American artist. To be completely honest, I am not very impressed by this official portrait done by her—It lacks the energy and edge of Kehinde Wiley’s painting. In my humble opinion, Nigerian-born, L.A.-based artist Njideka Akunyili Crosby, recent recipient of the MacArthur Genius award, would have been a much better choice for the Michelle Obama portrait. 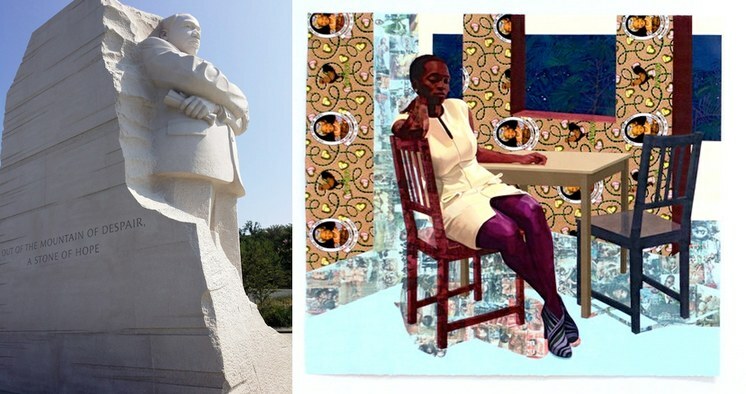 It makes me think about the monumental granite portrait of Martin Luther King Jr. near the National Mall, sculpted by Chinese artist Lei Yixin, who was simply the best artist for such a project. And that’s the way to go. 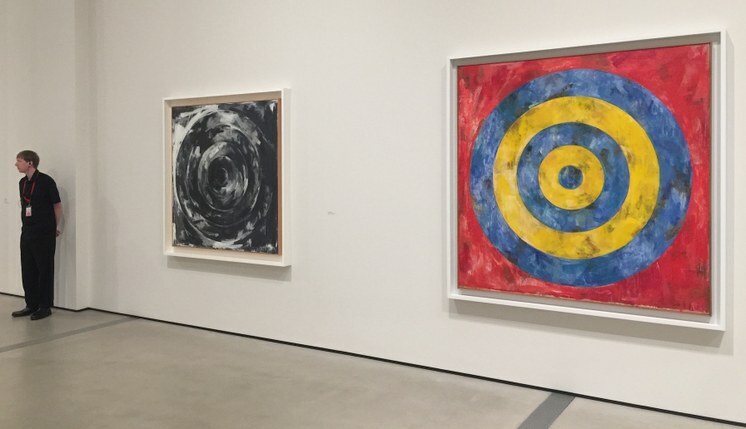 Before the breaking news covering the Obamas’ portraits, I was planning to devote today’s Art Talk to the major retrospective of works by iconic American artist Jasper Johns, which opened last week at the Broad Museum. Jasper Johns, “Something Resembling Truth” exhibition. Photo by Pablo Enriquez. Art © Jasper Johns/Licensed by VAGA, New York, NY. More than 120 of his works were borrowed from 60 public and private collections for this exhibition. Never before have we, Angelenos, had the privilege to follow six decades of his remarkable career. 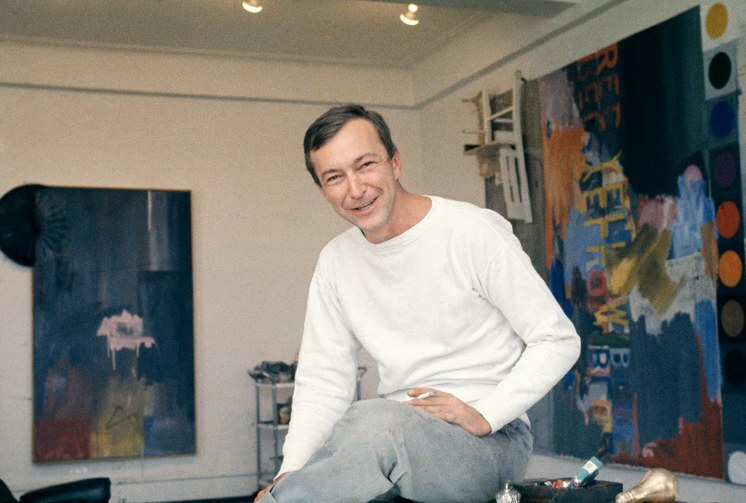 At the age of 87, Jasper Johns doesn’t like to travel, so he didn’t attend the opening of his show. But the feisty, young spirit of his art was there, bursting out of every painting, sculpture, print, and drawing. 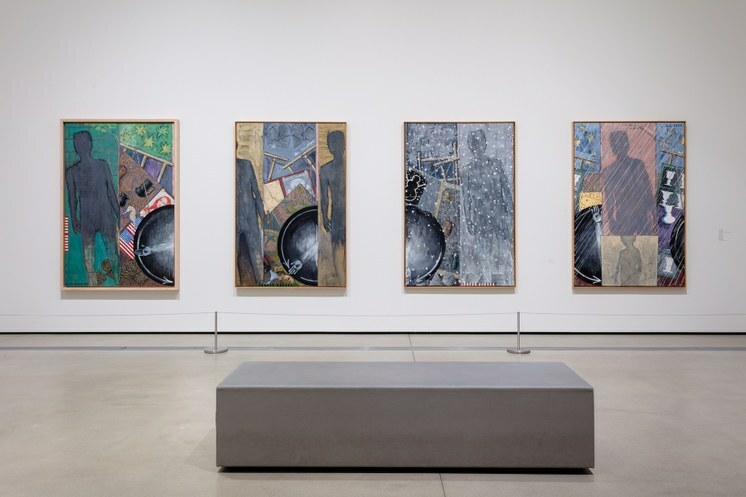 Jasper Johns, “Something Resembling Truth” exhibition. Photo by Edward Goldman.